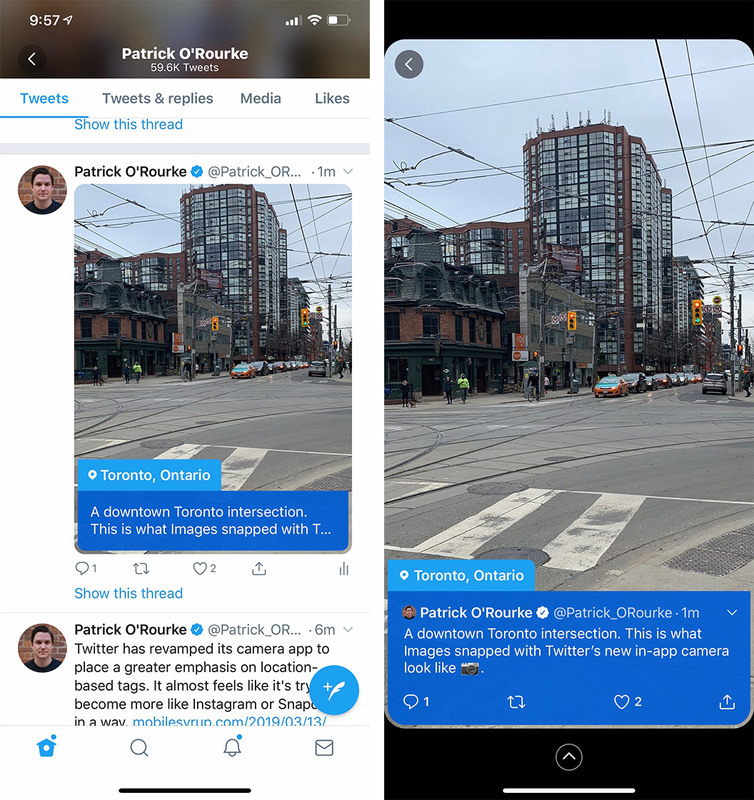 Twitter is releasing an update to its built-in, in-app camera that not only aims to make snapping photos directly inside of its app a simpler, more intuitive process, but that also places an emphasis on the sharing of location-based images. 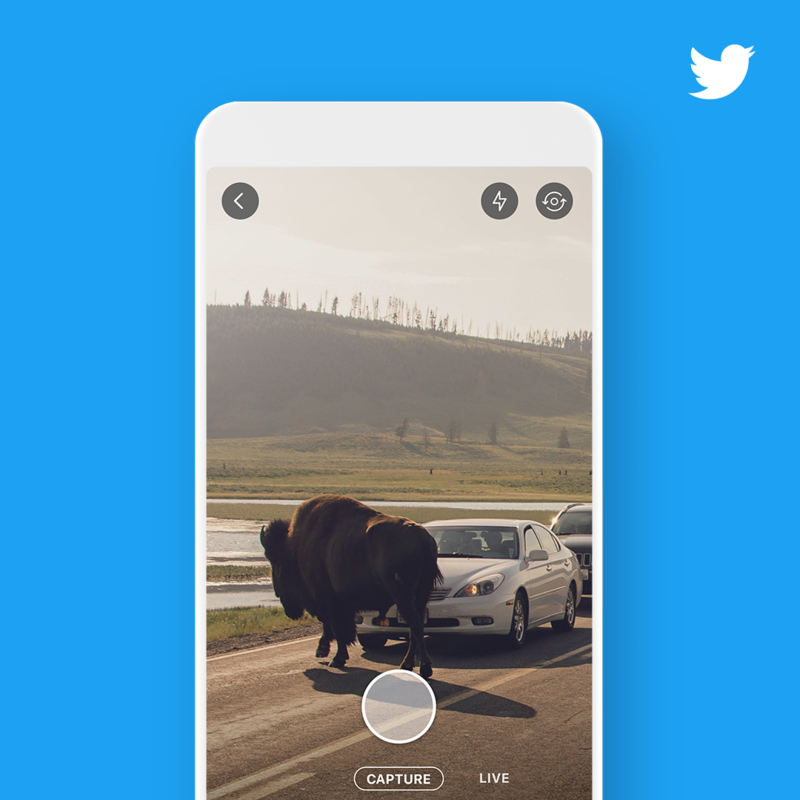 To start, Twitter’s in-app camera can now be accessed by swiping to the left of the social network’s home timeline. Once inside the camera, tapping on the shutter button snaps a photo, while holding it down longer shoots a video. Jumping to a livestream is now performed by swiping to the left within the camera app. In what seems like a continued effort to shift Twitter’s focus from following users to also keeping track of ongoing, live events, all photos and videos posted directly through the social network’s camera will now appear in a larger format with a changeable coloured text overlay. In a sense, this is also Twitter attempting to make the service more Instagram and Snapchat-like. Twitter says location tags as well as “relevant geo-based hashtags” can be added to images, making them more searchable. That said, at launch this feature will be limited to sporting events, says Twitter. During a recent interview with MobileSyrup, Keith Coleman, Twitter’s vice president of product, explained that these subtle but still substantial changes are part of the social network’s renewed emphasis on bringing new functionality to the platform. “The most important part is the camera is designed to be smart. It knows where you are and what is happening around you, and it uses that to get whatever footage you capture to the people who care and want to talk about it,” said Coleman. When asked if other new Twitter features are on the way, including the often rumoured and requested ability to edit tweets, Coleman explained that the social network is still in the process of evolving. “We view this as a step that’s part of a much bigger evolution of the service. Adding support for event experiences was a significant step in a much larger arc of evolution for Twitter… On the capture and tweeting side, this is an evolution of how you can post tweets. We see this as evolutionary and there are a lot of other steps coming.” said Coleman. 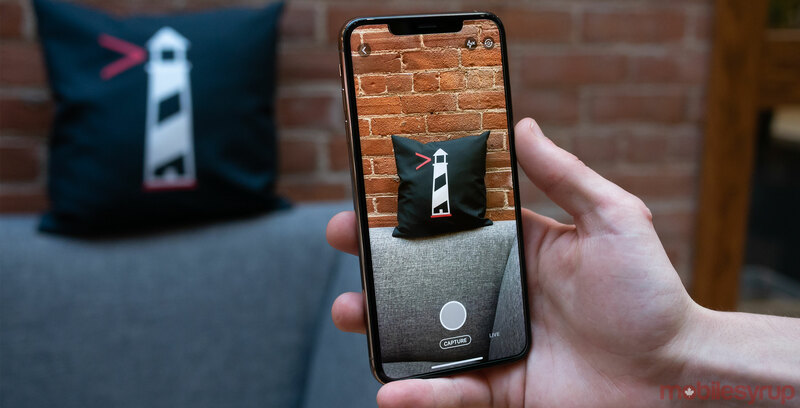 Regarding the new look of images, Coleman says this feature is currently exclusive to Twitter’s in-app camera but explained that the functionality could eventually expand to working with all images and videos posted to the platform. Twitter says its revamped camera app is rolling out now across iOS and Android. The new tweet format for images shot with Twitter’s in-app camera is also only available on iOS, Android and with Twitter’s web-based desktop app.